Now completely free! 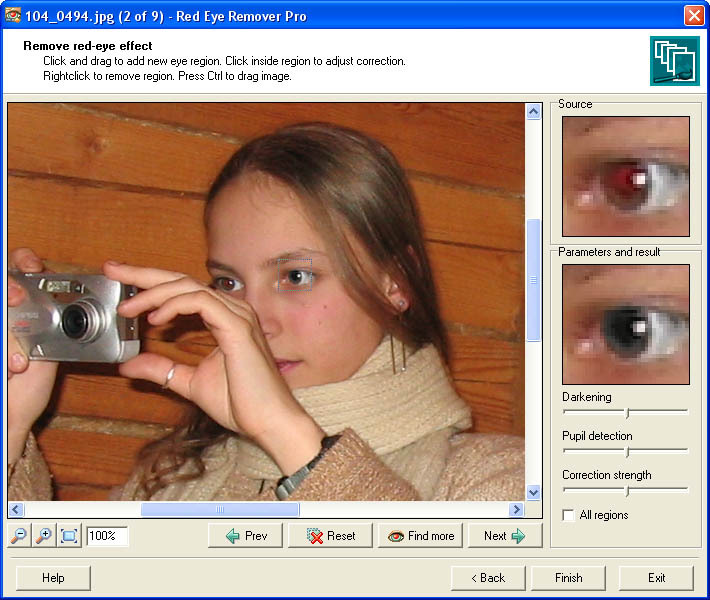 Red Eye Remover Pro is a must-have program for digital camera owners. Built-in flashes make red eye effect the most common problem for both professional and amateur photographers. Red Eye Remover Pro is a unique professional red eye correction tool based on advanced science-intensive technology. Red Eye Remover Pro is able to automatically detect and instantly fix red pupils in multiple photos making batch red eye correction fast and precise. The program fixes images with just a few clicks - you just load photos with red eye into the program and Red Eye Remover Pro does the rest. Instances of red eye are effectively detected and fixed in the fully automatic mode in the vast majority of photos (the detection rate is 90%). Even if the program fails to detect all red pupils in the fully automatic mode (this can happen for instance in low-quality photos), all you need to do is select a rectangular area around the eye for the program to fix it. To achieve best results, you can adjust the correction options, and watch the results in real-time: you can make the pupil area darker or lighter to give the eye a natural look; adjust the pupil detection; or change the correction strength. The program allows loading and saving three common image file formats (jpeg, bmp and png). It allows you to work with large collections of images at once and provides a number of saving options: you can save corrected images one by one or simultaneously; and save them to the original or new files. Red Eye Remover Pro also contains a plugin for creating thumbnails of your photos for web galleries. Automate multiple jpeg file operations. Rename with date picture taken. Converts EXIF metadata taken from photo files to nice HTML tables or TXT files.